These two photographs illustrate the "1949 Eastwood Steamer" Built By Robert E. Ostwald Box 351 Staten Island 1, N.Y. It consists of a "1910 Stanley Power Plant 10 Hp. [and a] 1940 Studebaker champ.[?] body." 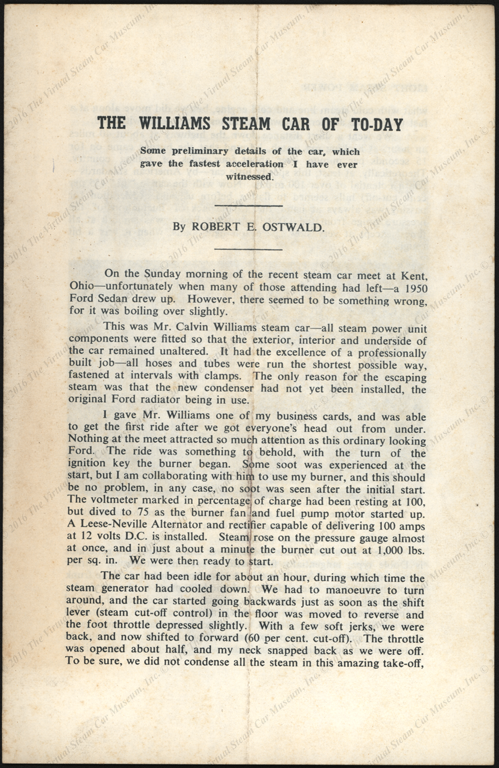 Robert Ostwald reprinted this article from Light Steam Power. Additional copies could be had from "Steam Developments, Box 335, Staten Island 8, N.Y."
Contact us if you have additional information about the Eastwood Steamer or Robert Ostwald or if you have questions.